« Do I really need to stretch before and/or after exercise? Think you need to sit down?? I often see clients who sit for long periods of time at work, and they often ask if this could be the cause of their back and shoulder pain, or their hamstring strains following their last run. – Tight hip flexors, hamstrings and calves. – Restricted hip movement due to tightness in gluteal muscles. – Stiff mid and lower back due to slumping and excessive spinal flexion. – Raised and hunched shoulders due to tightening of the upper and weakening of the mid/lower trapezius. – General muscle imbalances and postural changes. As with any habits, the longer they are in place, the harder they are to break, and nothing is going to change overnight ! However, with good intentions and awareness, all bad habits can be altered. Educating yourself is the first step, and understanding the implications of your habits and how they impact on other areas of your life are key. 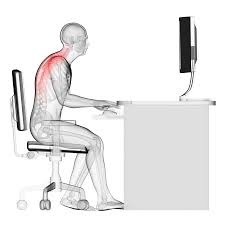 For example, if you are a keen swimmer and cycle to work, then spend most of your working life hunched over a computer screen, chances are you’ll have quite quite a number of muscular imbalances in the back and shoulders, and a marked increase in the curvature of your mid spine, which will ultimately affect your swimming stroke and reduce your performance. Another keen runner who is sitting behind the wheel all day might develop shortened hamstrings, which not only cause low back pain, but also increase the risk of hamstring strain. You don’t need to be an athlete either – you’re just as likely to suffer the effects of the above in your day to day life if you only walk the dog after spending most of your day sitting doing anything. – Avoid holding the phone between your shoulder and ear, and invest in a headset instead. – Adjust the height of your desk to ensure that you’re not tilting your neck to look at the screen. – Keep your elbows close to the body when using the mouse rather than reaching the arm forward. – Sit on a chair with a straight high back if possible, and ensure that the seat is high enough to avoid having your hips raised above the knees. – Keep feet flat on the floor whilst seated. – Place all items on the desk within close proximity and within hand’s reach. – Lie on a foam roller or rolled towel, placing it perpendicular to the spine, easing the spine into extension by opening up the joints. – Lying face down, push up on the arms into back extension, looking straight ahead. – Bend at the elbows and lift arms to chest height, rotating through the mid back and opening up the thoracic spine. – Standing about 6 inches from and with your back against the wall, flatten the shoulder blades and try to flatten Wthe back of the neck to reduce the excessive curvature in the upper back. – Maintain flexibility in the hamstrings, calves and hip flexors by stretching after activity when warm. This entry was posted in Uncategorised. Bookmark the permalink. Comments are closed, but you can leave a trackback: Trackback URL.